I was in the final stretch of making dinner last Friday night when I realized I hadn't heard from Teyla in a while. One of the primary lessons I've learned about that girl is this: Fear silence. I glanced into the living room. I could see Connor on the floor, next to the dolls where Teyla had been playing five minutes earlier. "Connor, is Teyla in there with you?" He didn't even look up. "No." I turned off the kitchen sink to listen closely. I heard a distant thud and a creak. It sounded like she was in the kids' bathroom upstairs. "Teyla!" I called. "What are you doing? Come down here and be with us!" No answer. Just another thud. I finished stirring the blueberry muffin batter, washed off my hands and walked upstairs. 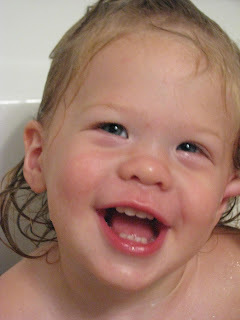 As I rounded the corner to the bathroom, Teyla jumped and grinned. She was standing in the bathtub, with a huge wad of wet toilet paper in her hand. Another wad of wet toilet paper was in her mouth, being chewed like gum. The toilet seat was up and most of the water was gone. She held out her extra wad, as if to say, "Want some?" "Teyla, there are no words for how disgusting this is," I said under my breath, as I pulled the TP out of her mouth and hand. But at the same time, I couldn't help but smile a little, because it was a moment that was totally Teyla. Ick-anything involving toilet water is just plain nasty. Your sweet Teyla is exactly like my Addison, who is a couple months younger. Get them together and I'm sure they'd be friends for life. They'd get in a lot of trouble together. Teyla and AJ are SOUL SISTERS! I can completely see Aliza Joy doing that. COMPLETELY. I have to turn my head to giggle a LOT around here. I love that upon seeing that scene, your first reaction was to love her and affirm who she is (albeit crazy :) ). All I can do is laugh! Now if you could just teach her to use a brush and swish while she plays in the toilet! Reminds me of the email my MIL sent of the mom who came home and the dad wanted her to see their little girl serve him his "tea" (water) for the tea party they were having. After he drank it (and he'd had several before mom got home), she said "you do realize the only water she can reach is the toilet!" So don't be having any tea parties with your girl! My cousins, growing up, weren't allowed to have any sugar. Their mother claimed they were allergic, but really it was just because she didn't want to deal with how hyper they got from sugar. Their solution (besides sneaking lumps from Grandma's sugar bowl) was to squirt toothpaste into toilet paper, wad it up, and chew it. "It tastes just like gum!" they insisted. Don't think they ever dunked it in the toilet bowl, though ... although knowing them, it is a possibility. So gross yet so hilarious! I love how you love her, crazy TP eating and all. She must have been channeling my Spike because he did the same thing tonight...as if it was candy....minus the water thank goodness. OMG but how can we get angry at them trying out new things which for them means nothing when you say disgusting? It's so true about the silence, isn't it? At least the last person to use it had flushed! We're really obsessive about where Elizabeth is in relationship to the toilet now after an "unfortunate" puddling incident which we are carefully not thinking about anymore. Hopefully both the toilet and toilet paper lose their fascination before she starts roaming the house alone! Just be glad she wasn't like Boo who did this, and then shoved it up here nose. i was NOT expecting THAT!! !